Hugo Tilmouth is an award winning Entrepreneur and Founder and CEO of ChargedUp. He has a background at the intersection of clean tech and startups. In this conversation, Hugo talks about ChargedUp. 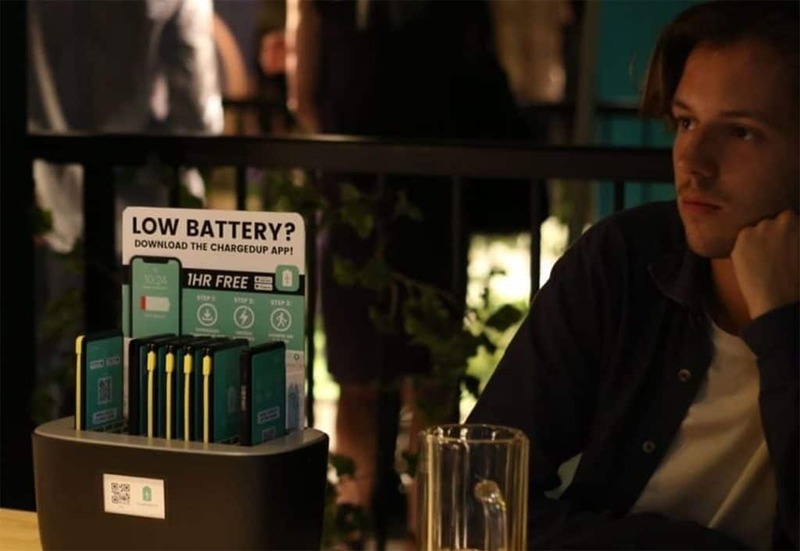 ChargedUp is a network of dispensing stations that allows users, for a small fee, to borrow a battery pack from one location, charge their mobile device and return the battery to another location. All the batteries are recharged using 100% green energy. Located in restaurants, cafes, transport hubs, sports stadia, and tourist attractions; users will never be far from a ChargedUp station. Can you tell us more about the concept of ChargedUp, and who benefits from this idea? Hugo: ChargedUp has developed a network of dispensing stations that allow users to borrow a battery pack, charge their mobile device and return the battery. Located in venues such as restaurants, cafes, transport hubs, sports stadiums, and tourist attractions; users will never be far from a ChargedUp station. Right now our network is spread across London and includes well known bars such as Pergola, the Prince, Swingers, the OXO tower and many more. Once a user has finished with their battery they can return it anywhere in the network, utilising the concept that has become so successful in the sharing bicycle sector. Both our partner venues and users benefit from our service. The venues gain additional footfall and loyal customers, by being featured on our app and providing a convenient service to their guests. We have also found that bar staff get asked on average 10 times per day to charge phones behind the bar. This is not only a drain on their time, but also many venues have banned this because of liability issues. ChargedUp solves this problem for them, while also solving the problem for their customers. ChargedUp is unique and innovative in a number of ways, not only are we the world’s first battery sharing network powered by green energy (through a partnership with Ecotricity); we also aim to disrupt the global market of “dumb” power banks with our smart shareable model. ChargedUp uses the sharing economy model, also used by successful businesses such as Airbnb, Uber, JustPark and Ofo bikes. With London’s bicycle sharing system popularly known as ‘Boris Bikes’ familiarising Londoners with this model, ChargedUp aims to expand at an exponential rate by providing a cheaper, eco- friendly and more convenient service, to the all too common problem of running out of charge when you are out and about. How do people find a ChargedUp station? Hugo: To find a ChargedUp station just download our app “ChargedUp” and it will show you the nearest stations around you. You can then visit a venue, borrow a battery and charge your mobile phone. It is as easy as that for Londoners today and it will be that easy for people in other cities as we expand. What are the issues ChargedUp is helping to address? Hugo: ChargedUp solves the problem of mobile phones dying when users are out and about. The ChargedUp stations enable anyone to borrow a battery pack, charge their device and then return the battery to any of our stations. ChargedUp benefits our partner venues by helping drive footfall to their venues and advertising their services via the ChargedUp app to thousands of potential customers. ChargedUp benefits our users by providing them a flexible and convenient solution to keep their mobile devices charged. Are you looking to replicate this idea in other locations worldwide? Hugo: Yes! We plan to roll this our across the UK and Europe, spreading further over time, to ensure every city can stay ChargedUp! We believe our eco-friendly message and the convenience that we provide will be a big hit with everyone who carries a mobile device or devices (almost everyone)!